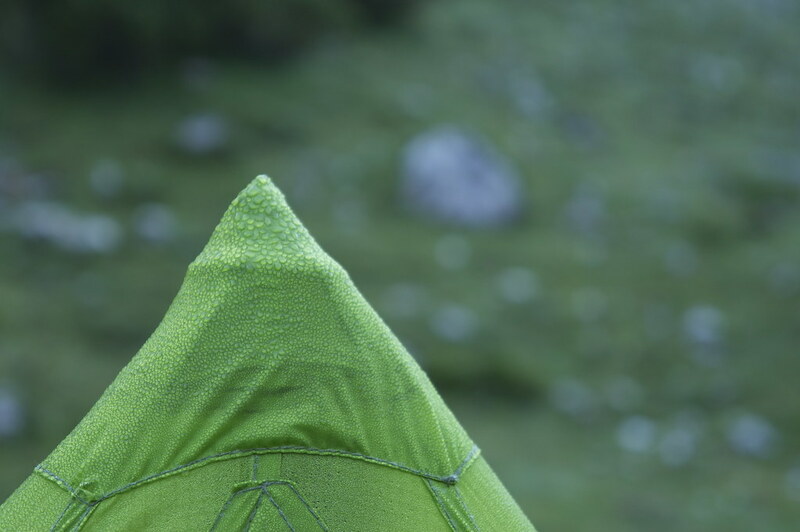 Pyramid shelters are the third wonder of the ultralight backpacking world. Fast to pitch, spacious, and very windproof these are versatile shelters which work in a multitude of locations and seasons. 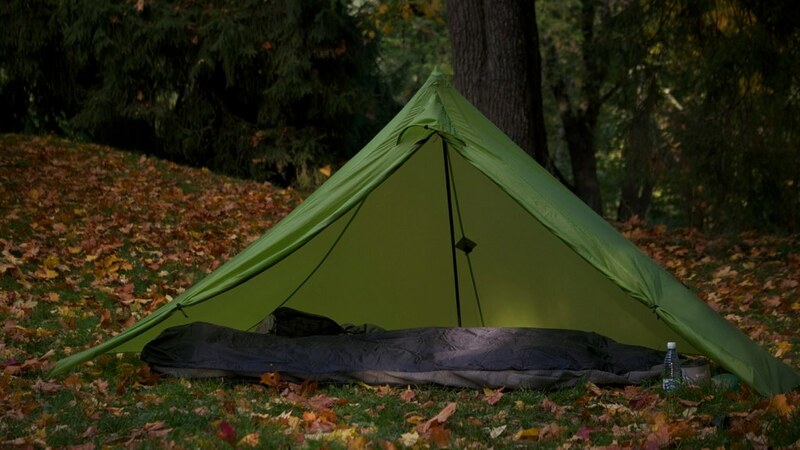 If you’re a true minimalist then a shelter like the LOCUS GEAR Khufu Sil might be all that you ever need. 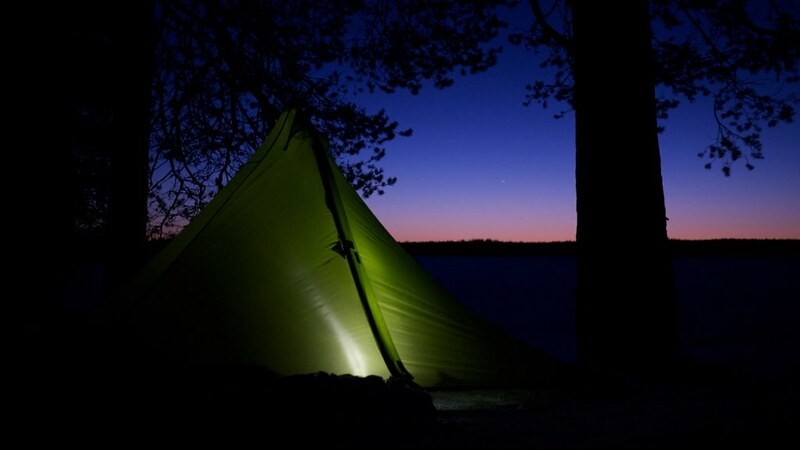 I have been using the LOCUS GEAR Khufu in Silnylon for over one and half years, in winter, spring, summer, autumn and winter again. There were starry nights, windy nights, snowy nights, rainy nights and sunny mornings spent in this shelter, on overnighters, week long trips and weekenders. A shelters function is to protect you from the weather, this often means rain, snow and wind. It gives you a place to get under if there’s no starry night, and to hold out during crap weather. You also might want to cook under it, and generally spend time in it if the weather just isn’t great. Depending on your priorities - do you walk a lot and only pitch your shelter once it’s time to hit the hay or do you spend a lot of time at camp - you will have different expectations from your shelter. 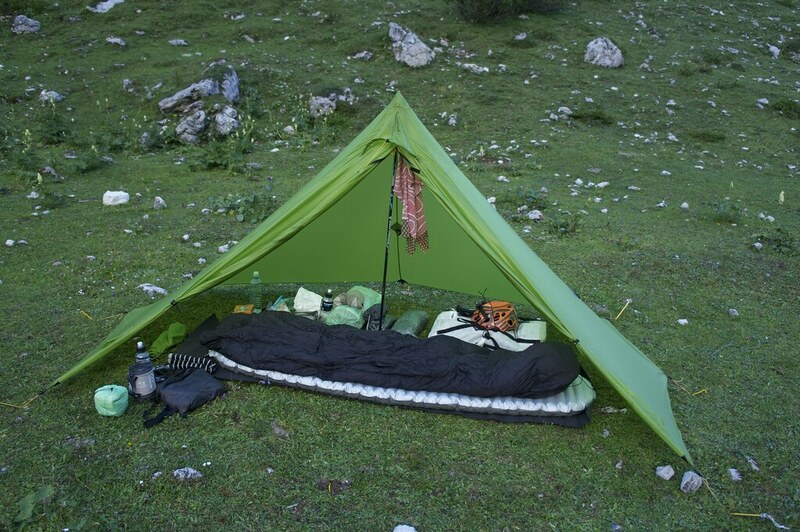 The person who hikes for 12 hours each day likely is looking for a lightweight, compact shelter which still gives her good protection during a thunderstorm at night, while the camper might prefer a very spacious shelter. 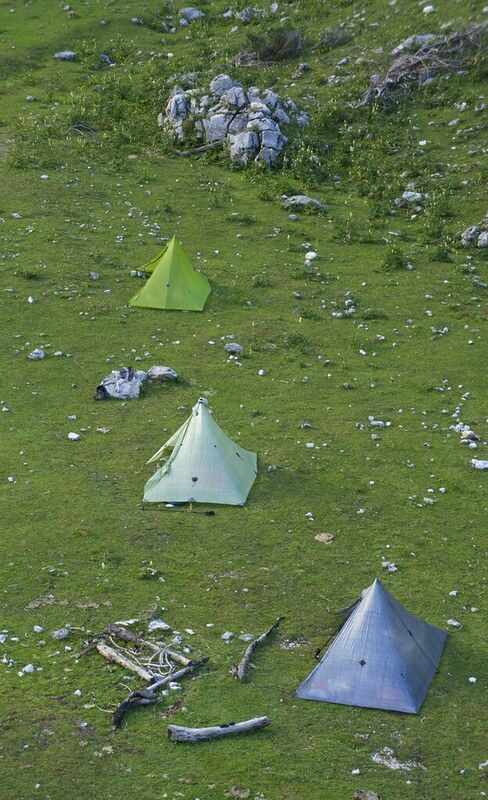 I think the Khufu fits both groups very well, though the hiker probably will value the shelter more because of its light weight and stormproofness. It packs in a small package and hence fits well even in smaller volume backpacks. 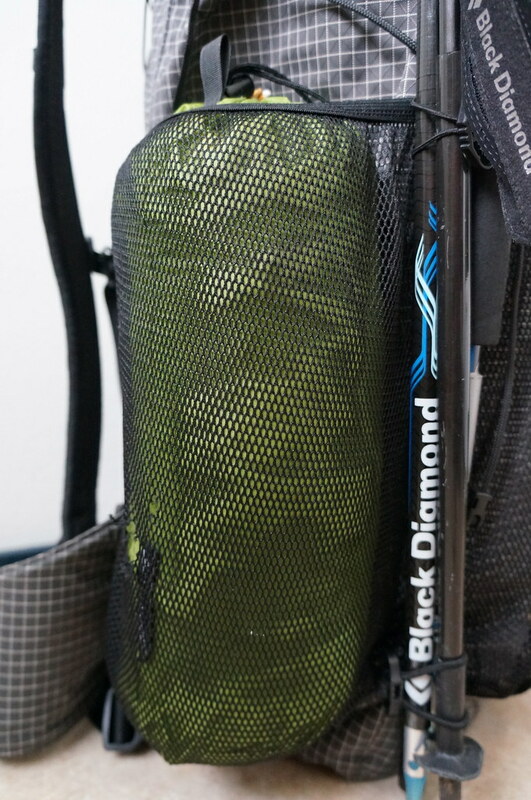 Those who have mesh pockets on their backpacks will find that it fits in a side pocket without problem, and takes also little space in the front pouch. The top has a mesh air vent, and while it works good I think it would benefit from being bigger. In conditions where there is a lot of condensation you will get condensation either way, but if there would be only a bigger air vent that might make the different between a wet inner or a dry inner (provided there’s a good breeze). The air vent has a wire in it so that it stays open, and while it can not be closed you can pull it close to the door with a guyline & line-lock to hinder spindrift snow come inside. You can circumvent the condensation by pitching one or two sides a bit higher to get more airflow, this would help in situations where this only little condensation, though. The doors can both be opened and rolled to the side, giving you fine views from under a roof. Of course you also can only open one door - roll them up and use the toggle and loop to keep it out of the way. The reflective guylines used are light, thin, and work very well. They could be a bit longer - especially if you use the shelter in winter but I have coped with the stock ones until now. The line locks are the small ones, and make it easy & convenient to re-adjust the tension of the shelter, especially in winter. Size matters in inclement conditions. 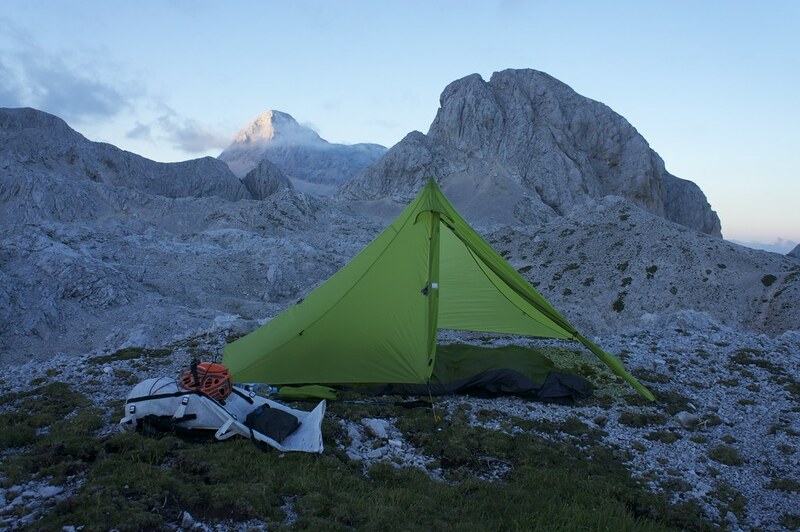 The Khufu is 130 cm high (if pitched with one pole; I have used them with my Black Diamond Ultra Distance Z-Pole Trekking Poles in 130 cm length), 160 cm wide and 265 cm long. The usable length I’d put around 200 cm and 140 to 160 cm in width. I’m 175 cm tall and for me there’s plenty of space for sleeping and gear in the shelter, but people who are 195 cm and taller might find that they touch the shelter with their feet or head when sleeping. There’s plenty of usable space to store gear along the perimeter of the shelter, and two short persons should fit in the Khufu without problem, even without using the DPTE, the Dual Pole Tip Extender which allows you to pitch the shelter with two trekking poles. The long side goes very steep upwards so the width inside is almost all completely usable, whereas the narrow ends have a more gradual angle and hence there is less usable space inside along them. I usually use the Dual Pole Tip Extender in winter, as that way I get more interior space and I imagine also in heavy snowfall the snow might glide down the side more easier (the latter I haven’t been able to confirm yet). 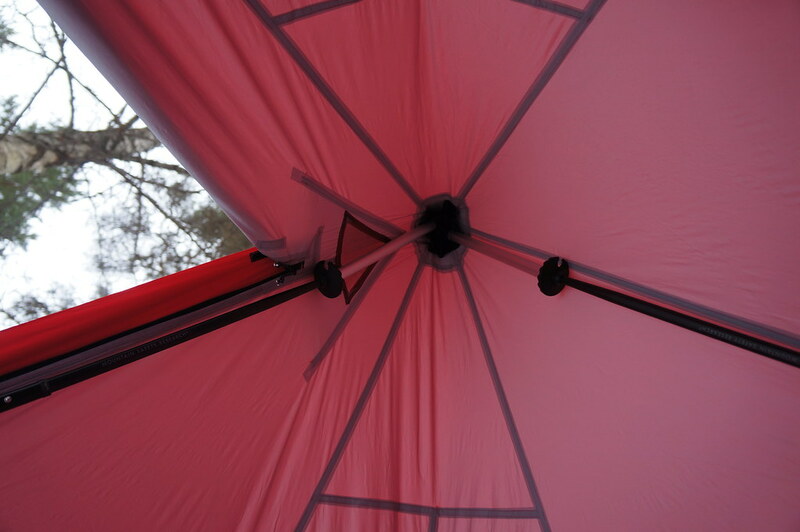 It allows you to pitch the shelter in an A-Frame instead of one pole in the middle, so if you’re with two people and want to be close to each other this is an essential tool. 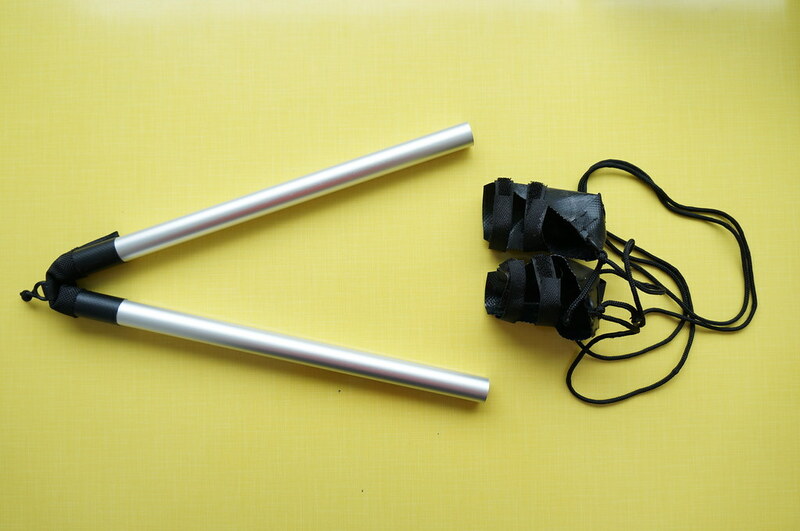 It’s 112 g heavy and consists of two aluminium pipes which are connected via a piece of fabric, and for the handles you have two baskets made of fabric which wrap around the handles and connect via a string, that way you get the right distance for the poles for the A-Frame. 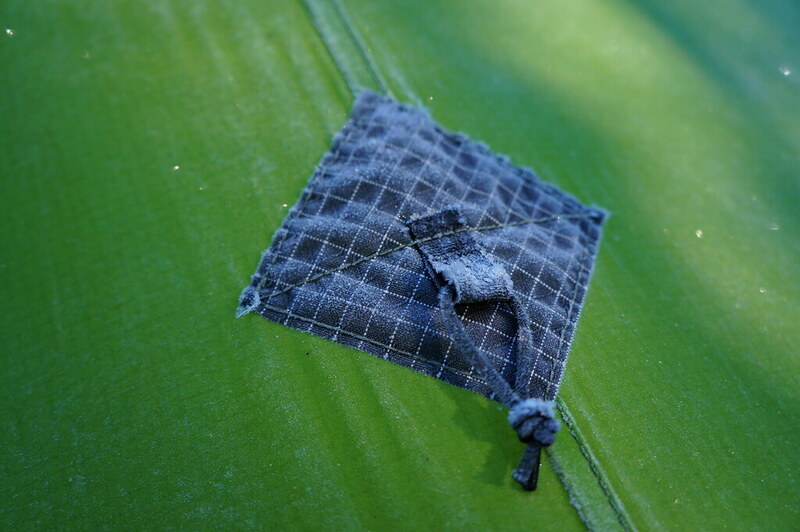 The Khufu has velcro straps on the inside which allow you to attach the shelter to the poles. It takes a bit more work to get a good pitch when using it, but it’s vert stable in the wind then. The top of the shelter, as well as the corner and mid tie-out points, have Dyneema reinforcements to not put too much stress on the silnylon. At the mid tie-out points there are elastic loops to connect extra guylines to. The beauty of the Khufu is that it sheds wind from all directions very well, of course it is best if you pitch the narrow side into the wind, but I have spent nights in the Khufu where the long side was in the wind, and there were no problems either. The Pyramid design has been around a bit. Black Diamond, GoLite, Oware, and Mountain Laurel Designs have been making Pyramid shelters for a number of years, and before them probably also others. 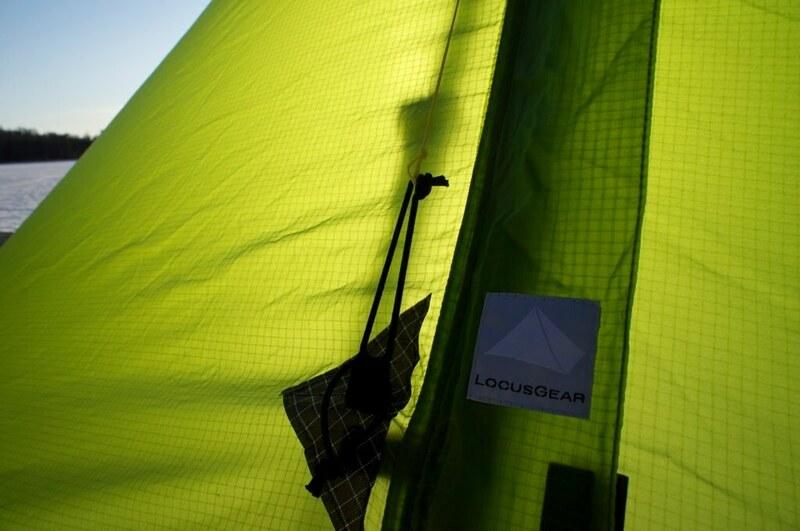 What makes the LOCUS GEAR Khufu special is that you can get it in a number of materials: Silnylon, highly breathable eVent II, ultralight cuben, tyvek and also a mesh inner is available. This allows you to pick the one Khufu (or two) you need for your conditions, which is a smart move, in my opinion. Add in the DPTE and you really can make this the one shelter to suit every need you might have. The workmanship of the Khufu is superb. There’s something about Japanese craftsmanship that just makes me awe. Like a well made 刀 or katana the gear I have seen from Jotaro is of the highest quality, and attention is paid to every detail. Be it the materials, seams, guylines and line-locks, everything that goes into making this shelter is like a high quality, fresh ingredient, used by a Michelin Star Chef to create a perfect meal - or in this case, a superb shelter. Even after a year of use in each season the shelter shows no signs of durability issues. 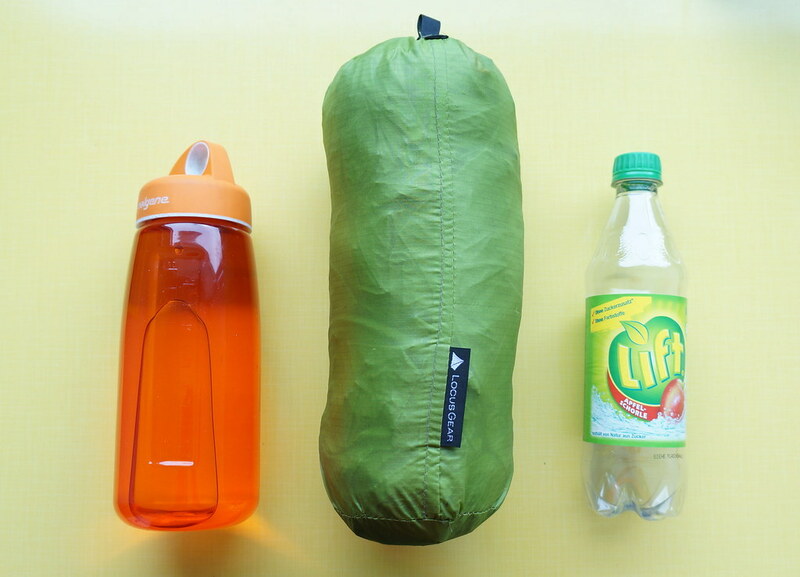 The silnylon still is waterproof and the zipper runs as smooth as on the first day. No thread has come lose either, and overall I have been very happy about the durability of this shelter. My Silnylon Khufu weighs 399 gram including guylines. The stuff sack adds another 12 g. The new Khufus (from 2012 onwards, Aspen Gold & Alpine Green) are a bit heavier, about 60 g, as LOCUS GEAR is using a new Silynlon which is even higher quality than the one in mine. 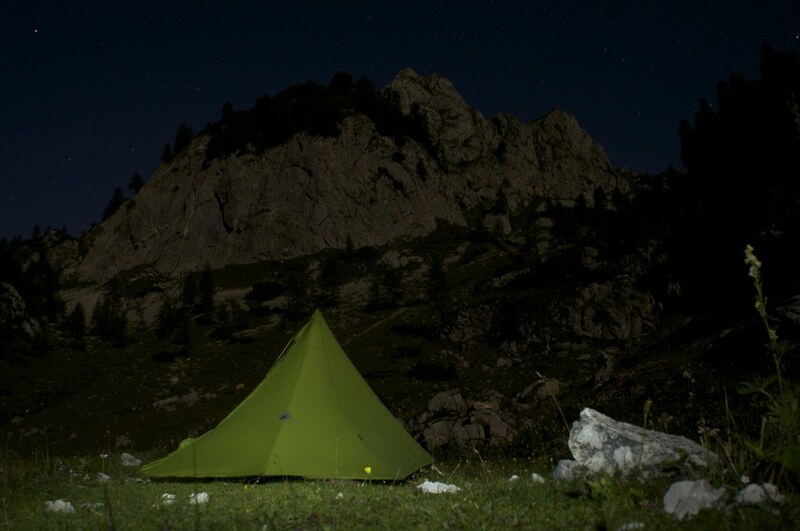 Products that occupy the same niche are the Mountain Laurel Designs DuoMid (481 g), Black Diamond Mega Light (1050 gram, 4 Persons), Black Diamond Beta Light Tent (535 g, 2 Persons), Oware Alphamid (524 g), so just going by the listed weights it seems the Khufu Sil is the lightest Pyramid Shelter available at the moment (in Silnylon). LOCUS GEAR pyramid shelters like the Khufu and Khafra are perfectly planned to use the whole fabric in the maximum width so that there are as little leftovers as possible. Even if there are remnants these will be used for accessories, e.g. stakes sacks and stuff sacks. 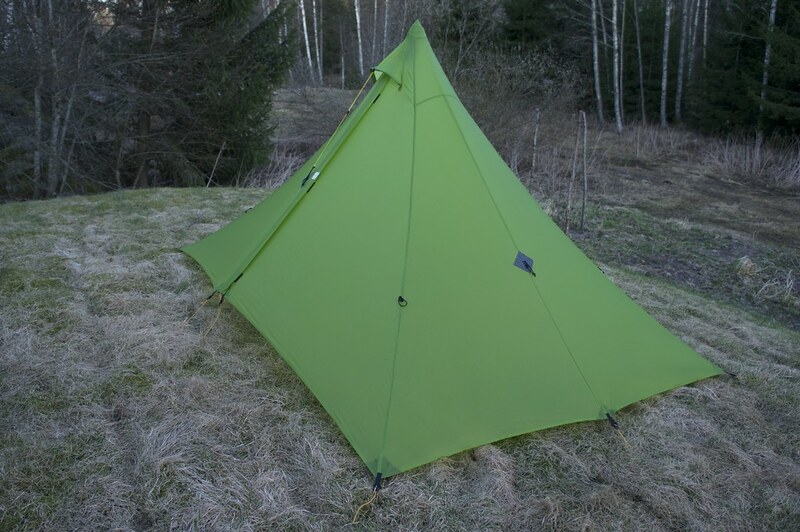 The MLD DuoMid & Oware Alphamid are a rather similar design, then there’s the Black Diamond Beta Light Tent, and the GoLite Shangri-La who all are Pyramid-shaped to some extent. There’s probably more, but I’m not aware of them - if you know others, let me know in the comments. Ryan Jordan likes his cuben Khufu. Benjamin has taken his Khufu Sil out many times in Germany and Switzerland, and Marius & Jake just got one each in Aspen Yellow. I like the LOCUS GEAR Khufu so much that I decided to get a second one in eVent II (which will be reviewed in due time). If I go out on a pleasure trip where research and testing gear isn’t a priority, I grab the Khufu Sil and know that I have a shelter with me that can withstand anything I could encounter - strong winds, snow, rain or a mix thereof. If I want privacy on a camping place I close the doors and have ample space inside. If I want views I open both doors but still am protected from wind and weather. I can sit straight up in it and can get easily dressed/ undressed. It is a superb shelter which I can recommend to anyone who wants a lightweight shelter which works in all seasons and environments. It is versatile, comes in great colours (I love that green!) and is extremely well made. - Longer standard guylines - even 10 cm more would do it. - Attachment loops/ tie-out points inside at the head/ food end for easier bivy guyline attachment. These are personal things I’d like improved, and at least #1 I could easily fix myself (and likely will at some point). 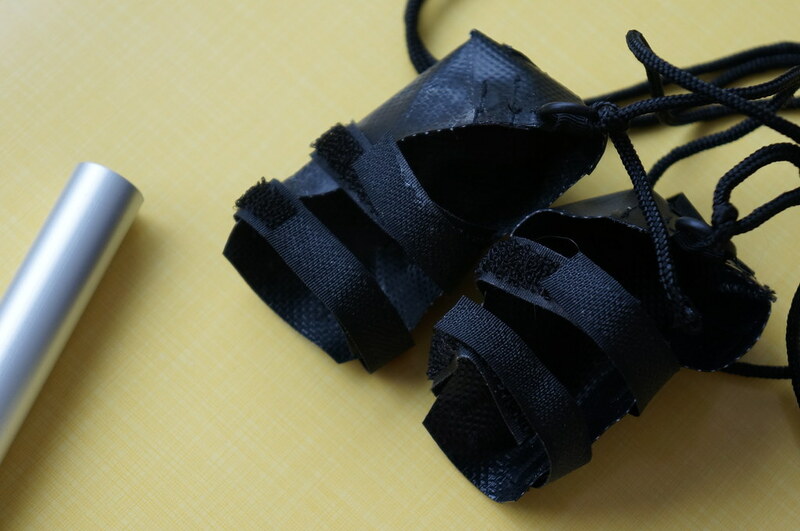 The LOCUS GEAR Khufu Sil can be bought exclusively at LOCUS GEAR. An English website is coming soon, which should make ordering easier, though buying it is as simple as choosing the shelter you want, hit the PayPal Checkout button and follow the instructions on the following pages (and Google Chrome has the nifty translate page function in case you can’t read 日本語). If you have questions, Email Jotaro who is always quick to answer and willing to help you. In some of the photos you see the red/ grey Khufu eVent II. Both shelters are the same design, just different materials.